What to feed pigs is an important first step to ensure maximum weight gain for the herd. Feeding and nutritional strategies for pigs, no matter the age, is one of the keys for success. Certainly, there are many considerations that can influence production, and your farm’s profits when managing your herd. The success of any commercial pig enterprise will be affected by a variety of factors, such as genetics, health, environment, feed intake, and ability to meet nutritional requirements with the right ingredients at the right price. Each of these factors has to be considered. Pork producers who properly design feeding and nutritional programs can increase production and will be rewarded. One of the best signs of success is directly related to knowing what to feed pigs for the utmost weight gain. Because genetics, environment, and feeding patterns of the herd will play a role in your nutritional strategy, you will need to have the right diet formula in place to meet those needs. This means developing a feeding program that will fit the production needs of the herd. Decide on an assortment of ingredients in formulating the diet for your nutritional program. A balance of energy sources and protein is necessary. Quality and quantity, along with selecting the right feed, play an important part in maximizing an increase in weight. Your feed should be low in fiber. It takes considerable energy for pigs to digest fiber. The more calories burned in high-fiber diets, the less calories a pig absorbs, and the less there is available to turn into growth. Selecting the right protein source is necessary for maximum weight gain, too. Thus, the protein should be high in the amino acids and peptides that pigs need for growth. They are the structural units of protein, not just crude protein. More importantly, amino acids are required in all stages of a pig’s life to continue to grow muscle and weight, and enable normal body function. Though cereal grains and corn are a necessary energy source, they are a crude source of protein and deficient in essential amino acids for pigs. Protein supplements combined with cereal grains can provide the correct amount of amino acids. Combining soybean meal with grains or corn will make sure your pigs have the amino acids they need. Of all the plant proteins, in terms of quality amino acid content, soybean meal alone compares with animal protein. In fact, it can be used as the sole protein based ingredient in most swine diets. Also, of all the plant-based meals high in amino acids, soybean meal is the most economical. As an energy source, choose a grain mix of barley, wheat, sorghum and corn for your pig’s diet. At least half the mix should be number two yellow corn. Though low in protein, it is considered a primary energy source in pig diets. It is also one of the most economical feed stuffs available for swine production. 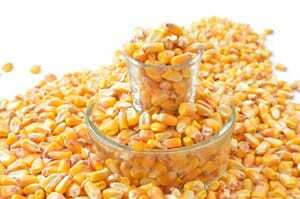 Industry recommendations suggest grinding the corn to 650 microns. The smaller particle size aids in digestion and give pigs more of the energy they need. Finally, using the pig’s favorite grain mix will increase its weight. Once you have determined the right feed for your herd, the correct feed intake is the next step. The amount of food available can be either measured or predicted. Without the right equipment, there are drawbacks to each. For example, measuring feed intake assumes that the amount of feed in the trough was eaten, and not lost to wastage, which in fact, without the right feeder, a portion of it is. The amount of feed that goes to waste can be well managed with the correct feeder. Osborne hog feeders are designed to meet the specific needs of both professional producers and hobby farmers worldwide. A variety of ultra-strong and long-lasting round feeders for indoor and outdoor finishing and even ad-lib feeders for lactating sows are available. Osborne Big Wheel feeders are simply the most efficient feeders for growing pigs from the nursery or wean-to-finish barn to market. 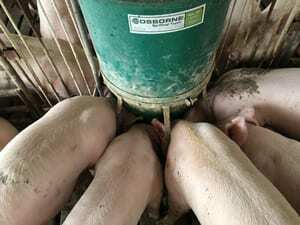 Their mechanical-flow design means that feed goes into the pig and isn’t wasted, which can often happen when using traditional gravity-flow rectangular feeders. They are designed to maximize weight gain by promoting optimum feed efficiency, eliminating wasted feed, and assisting in the automation of your feeding process.